You can choose between english and french words. Feel free to contact us in case of problems, comments or wish toimprove. Simple game and addictiveThrough two game modes, shear your sheep as fast as possibleoras much sheep in a given time.With your finger, walk through the coat until there have nomorehair on his back.Sheep Shearer is the game that will entertain young and old.Good shearing! Turn on your reflexes in this maze game inwhich you must find the exit while avoiding the pitfalls.Have fun through three different styles of play, and more than80 free levels (more will come soon).Feel free to contact us in case of problems, comments or wish toimprove. This is an enhanced version of the game Simon.This version has:- A multi-player mode- You can select between 2 and 8 colors- A version of the game where you play sequences in thereversedirection- Or a version of the game where each sequence is randomized. The classic game of truth or action, butitspeaks!With questions (truth) and dares.For fun with family or friends.The application proposes various actions and truths,updatedregularly, but you can also add yourself.One option offering naughty questions or actions is availabletowarm the atmosphere among friends. Hangman is the classical hangman game, withmore than 1000 easy words, more than 20000 difficult words andother categories like music, sports ...You can choose between english and french words.Feel free to contact us in case of problems, comments or wish toimprove. Hangman: The classic word game in a free version for Android.Hangman is available in 31 languages, including english.Playhangman in your own language and not in english thanks to this freeapplication compatible with every android phone and tablet. Eachsupported language has 10.000 words to guess! This app is unique inthe android market and it's free. Recommend hangman to yourfriends, and please rate it 5 stars if you like it.List ofsupported languages: Bulgarian (български), Brazilian (Brasileiro),Czech (Česká), Danish (Dansk), German (Deutsch), Greek (Ελληνική),English, Spanish (Español), Estonian (Eesti), Finnish (Suomi),French (Français), Hebrew (ברית), Croatian (Hrvatskom), Hungarian(Magyar), Indonesian (Indonesia), Islandic (Íslensku), Italian(Italiano), Lithuanian (Lietuvių), Latvian (Latviešu), Macedonian(Македонски), Dutch (Nederlandse), Norwegian (Norsk), Polish(Polski), Portuguese (Português), Roumanian (Română), Russian(Русский), Slovakian (Slovenčina), Slovenian (Slovenski), Albanian(Shqiptare), Swedish (Svenska), Turkish (Türk).Cool graphics. Funnysounds.Available in 31 languages.3 levels of difficulty.300.000words to guess.Hangman is ideal to play a quick game in the subway,in the school yard, or at work during a break. A free word game foradults and for kids.Hundreds of hours of fun with Hangman: Hangmanis free for your Android smartphone or your tablet. *** The classic HANGMAN game is available on your Android device atlast! *** Guess each word letter by letter to avoid a grislyfate... When you've mastered that, compete against your friendswith two different game modes—challenge each other on Facebook oruse our new, exciting head-to-head two-player mode! FREE HANGMAN iscompletely free to try! The arcade version contains hundreds offree questions—how many can you solve? PLAY AGAINST YOUR FRIENDSCompete against your friends on Facebook! Or use our two-playermode to play face-to-face! FUN CATEGORIES Pick from a wide varietyof categories like celebrities, music, movies, geography, sports,etc. USE HINTS Stumped? Reveal and remove letters to avoid agruesome fate! CHALLENGING WORD GAME HANGMAN contains so manyquestions that less than 1% of all players manage to solve themall. Will you be one of them? Challenge your friends to a game ofHANGMAN today! Pendu: Un jeu amusant et gratuit. Devinez le mot secret enfrançais. Avec 3 niveaux de difficulté.Choisissez les lettres del'alphabet et devinez le mot secret. Mais vous devez le faire avantque l'homme ne soit pendu!Un jeu de mots gratuit, vraiment 100%gratuit. Avec 10.000 mots à deviner.Vous pouvez jouer dans lemétro, à l'école, au bureau.C'est un jeu amusant, et c'est un jeufacile. Et c'est un jeu gratuit.Il y a 3 niveaux de difficulté:facile, moyen, difficile.Le jeu comprend un tableau des meilleursscores. Donc, essayez de faire le meilleur score possible.Ce jeugratuit est très addictif et vous aurez toujours de nouveaux mots àdeviner: 10.000 mots!Le Pendu, un jeu de mots gratuit enfrançais.Hangman in French.Hangman: A fun and free game. Guess thesecret word in French. With 3 difficulty levels.Choose the lettersof the alphabet, and guess the secret word. But you must do sobefore the man being hanged!A set of free words, really 100% free.With 10,000 words to guess.You can play in the subway, at school,in the office.This is a fun game, and it's an easy game. And thisis a free game.There are 3 difficulty levels: easy, medium,hard.The game includes a highscore table. So try to get the highestscore possible.This free game is very addictive and you will alwayshave new words to guess: 10,000 words!Hangman, a set of free wordsin French.Hangman in French. This is the classic word game Hangman. You have to guess the word,letter by letter. There are following categories of words withinthis hangman game: * cities of the USA,pop stars, * actors, *animals, * names, * countries of the world, * states of the USA, *presidents of the USA, * food, * weapons. You may also selectanother country and try to guess words specific for this country.The hangman game is often used to learn languages or geography orother subjects. Learn french by playing hang with Sarkozy! 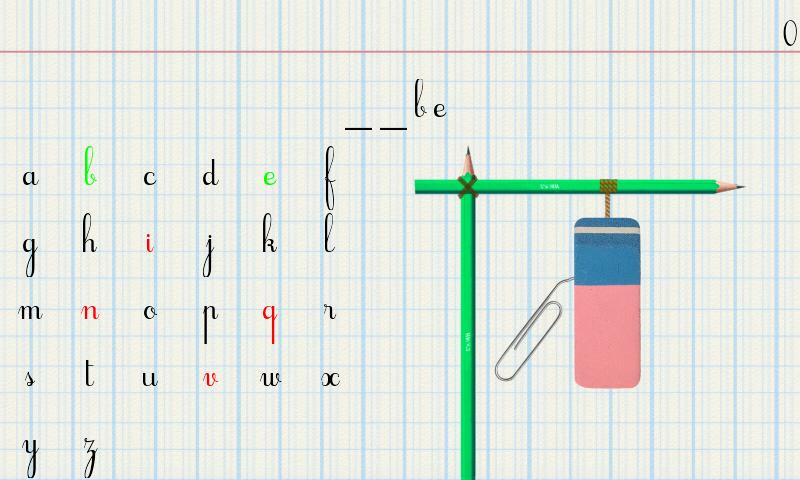 Hangman is a classic word puzzle game. It's simple - just guess thehidden word. Game variants: - One player game - Two player game onone device - Time trial - guess 10 random words as fast as you can.This version also includes: - Statistics for your games (win/lose)- Help button which reveals one random letter - Categories:general, food, animals, countries and capitals, names Have fun! Play Hangman now for free on your AndroidPhoneor Tablet! [*] The words are divided by category. [*] Try to get the biggest highscore and beat your friends! [*] Score more points by victories in a rowSupported languages :EnglishFrench ( Francais )Dutch ( Nederlands)Enjoy playing!